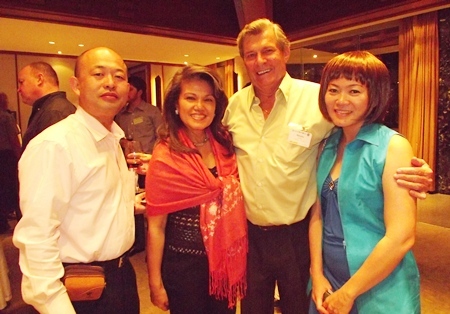 The British Chamber of Commerce (BCCT) held their latest meeting at the Pullman Aisawan Resort on November 18. With all the traffic jams in Pattaya currently (a combination of additional traffic from Bangkok and some inexplicable restrictions put up by the Traffic Police), it was a wonder anyone managed to get through to the resort, but the hardy ones did manage it. The numbers were also swelled by the Automotive Focus Group which joined the BCCT members and friends after their meeting had concluded. The Pullman’s GM Clinton Lovell attended, making sure everything went like clockwork, and it did. Mention must be made of the great food (and drink). 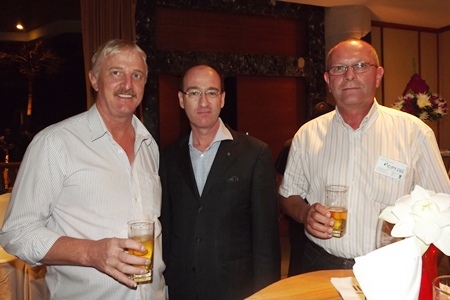 The Pullman Aisawan has been setting a consistently high standard in their hospitality, and considering that the BCCT networking venue had to be changed just before the date, it made Clinton’s team effort even more outstanding. Mike Diamente, Bruce Hoppe, Neil Maniquiz, Judy Hoppe and Roseanne Diamente seem to be having a wonderful time. 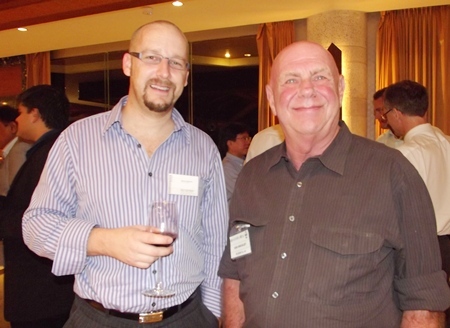 Many new faces attended, including some networkers new to Thailand, such as Anthony Collier, who has set up a branch of his architectural business in Chonburi, with his 30 year old head office in the UK. Looking at the fact there will be need for staff recruitment after Thailand gets over the floods and re-building commences, JAC Recruitment Eastern Seaboard had Branch Manager Wilasinee Towijit and consultant Krisana Thongbu-rarn on hand to make their presence known. 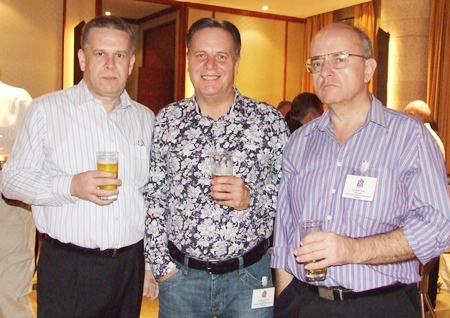 These networking evenings would not be the same without the dynamic CEA group, and this time it was Projects Director Andy Hall who represented the company. The Bangkok Hospital Pattaya was represented with Neil Maniquiz explaining the heavily discounted ‘Father’s Day’ check-up packages to those who were interested. 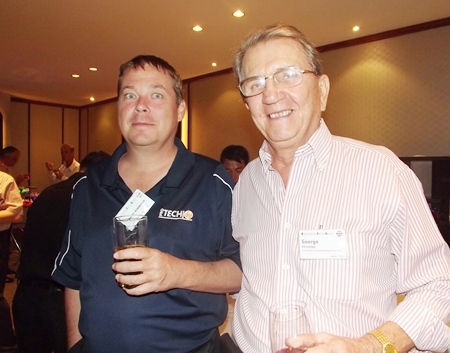 A very busy networker was J. Bou van Kuyk, with his card suggesting that as an international business consultant he could find solutions yielding 25 percent return on investment. He ignored my B. 100 as not being the level at which he operated! 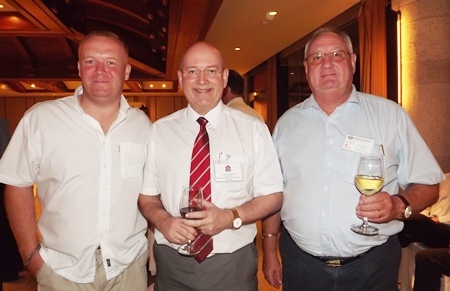 George Strampp (back from Italy) and Ron Kosinski brightened up the evening, as they always do, while BCCT Chairman Graham MacDonald ensured everyone was enjoying themselves. 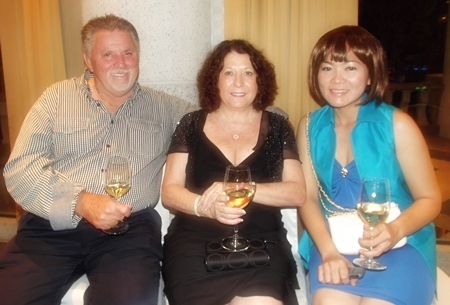 One group that really did let their hair down was Dr. Iain (celebrating his 70th birthday that evening), wife Som and their friends from Australia John English, Rainey Cherry and Ian Munro. 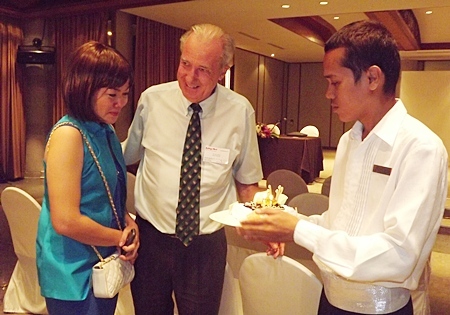 Peter Malhotra, MD of the Pattaya Mail Media Group gave an eloquent speech about Dr. Iain’s contribution to the Pattaya Mail and to Pattaya itself, after which Clinton Lovell arranged a cake in less than five minutes! 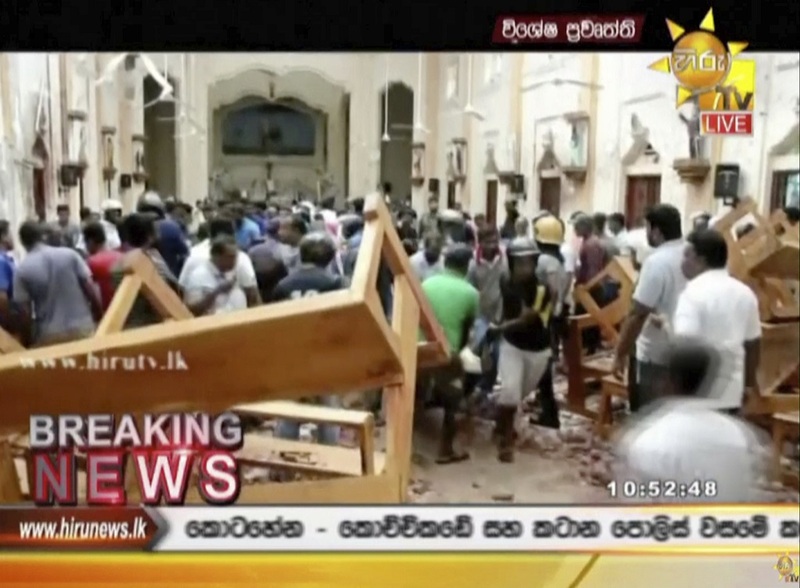 It was demolished in even shorter time! 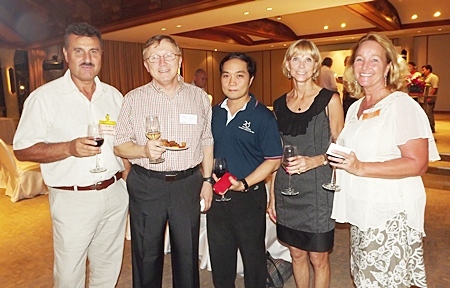 For those who missed this very good networking evening, the next BCCT event will be a joint networking with the Australian-Thai Chamber of Commerce on December 9 at the Amari. 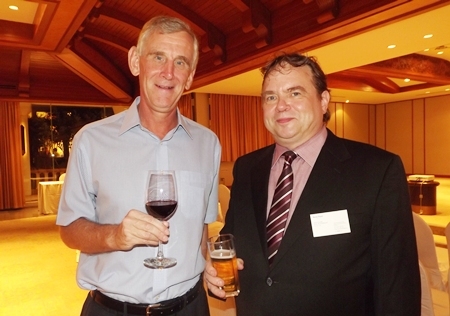 Jerry Stewart (left) gets cooking lessons from Dusit Thani Executive Chef Adrian W. O’Herlihy. 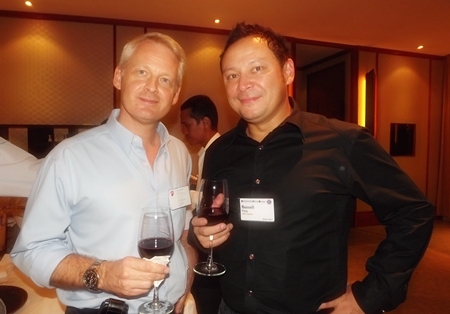 Alain Deurwaerder enjoys a drink with Russell Pang. 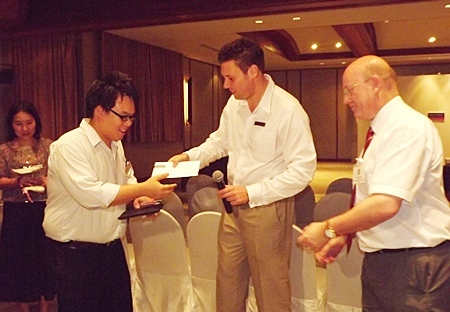 Clinton Lovell GM of the Aisawan Pullman presents the winner with his lucky draw prize. 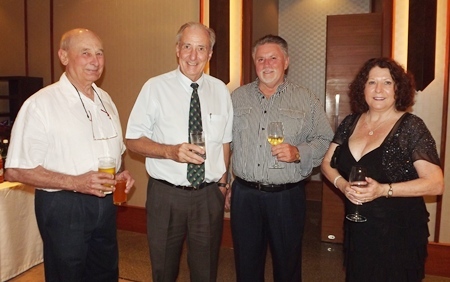 Dr. Iain Corness (2nd left) entertains his long time friends from Oz, Ian Munro, John English and Rainey Cherry. 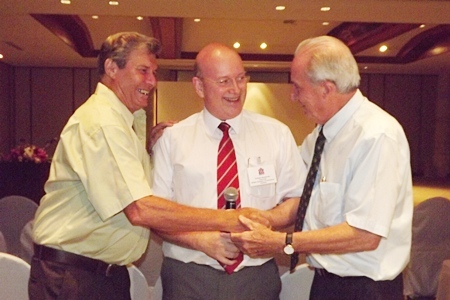 Graham Macdonald congratulates the birthday boys, Maurice Bromley and Dr. Iain. Som is moved as the Doc beams on being presented with his birthday cake. Maurice Bromley is a happy fellow with wife Renita and Som Corness in his arms. Nigel Quinnell loves to pose with pretty girls. 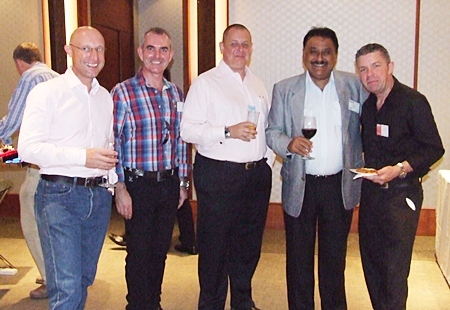 Boys about town, John Hamilton, Craig Muldoon, Garry Irvin, Peter Malhotra and Paul Strachan.